The video advertising display owner will be using NFC specialist Blue Bite’s mTag platform to offer advertisers the ability to provide shoppers with access to content downloads, web-based games, promotions and more via NFC and QR codes. BLUE BITE: Communicating with consumers on their most personal screen. Click to enlarge. Adspace Digital Mall Network has announced a collaboration with NFC marketing specialist Blue Bite to add NFC capabilities to its video advertising displays in 140 US shopping malls. 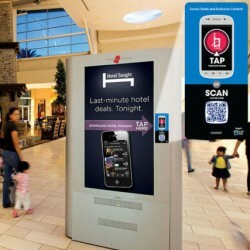 The addition of Blue Bite’s mTag technology, which supports both NFC tags and QR codes, to Adspace’s Smart Screens will enable advertisers to offer consumers access to content downloads, web-based games, promotions and coupons, maps and social media integration by tapping or scanning the attached mTag placard on the side of the unit with their mobile phones. The content will be location specific, allowing advertisers to target campaigns by consumer demographic and by individual mall. “Utilizing Blue Bite’s mTag technology will extend a brand’s message featured on our Smart Screens to a shopper’s mobile device, encouraging them to interact on a deeper level,” said Adspace Networks’ CEO and chairman Dominick Porco. “As consumers become increasingly reliant upon their mobile phones, the ability to communicate with them on their most personal screen will transform the shopping experience,” said Mikhail Damiani, co-founder and CEO of Blue Bite. Adspace Smart Screens fitted with mTag will be available to advertisers from 15 April.